The Leptin Diet seeks to balance Leptin, which is a hormone that assists in regulating both appetite and metabolism. Leptin was only discovered in 1994 – therefore research is only very recent. Leptin levels are generally proportional to body fat, as leptin is released by fat cells. It is thought that many obese people may have developed leptin resistance – whereby the body fails to respond to leptin signals. This begins a cycle where more leptin is produced. Mastering Leptin teaches dieters to blance leptin and cause it to start working again by following a prescribed eating plan. Basically, dieters should avoid eating for 5 to 6 hours between each meal. Meals should be low in sugar and refined carbs but high in protein and fiber. The protein and fiber will help the dieter feel fuller longer and make the fasting time easier. Dieters should also be aware of foods that “induce cravings” and avoid those types of foods. These can be different for different people but usually these foods are high sugar, high salt, and high simple carb type foods. After two weeks of eating in this manner the body will adjust and the Leptin diet will be much easier. The Rosedale diet by Dr. Ron Rosedale explores dietary solutions for correcting leptin imbalances. The Fat Resistant Diet by Leo Galland is anti-inflammatory diet that also addresses leptin. I’ve been on an anti-inflammatory diet geared towards regaining leptin sensitivity since mid May which I derived from information found in Galland (The Fat Resistance Diet), Richards (Mastering Leptin), and Rosedale. I included information from anti-inflammatory eating plans not geared towards regaining leptin sensitivity as well, since my blood work shows high levels of systemic inflammation. This primarily involved elimination of nightshade veggies in addition to all the guidelines in the leptin diet books. There are a number of inconsistencies between the various anti-inflammation plans AND between leptin diets so I kept what made sense to me and ignored the rest. I avoid all soy, starchy carbs and foods including added sugars. I avoid most processed foods but still eat relatively clean foods like Larabars on occasion. I buy only in the organic section. I do eat non-fat yogurt and kefir and occasionally eat a few nonsalted raw almonds as snacks but do follow the Richards meal timeline rather closely. Since I have to get all my thyroid hormones artifically, I have to time my meals carefully anyway. I noticed that within the first 2 weeks I experienced a profound reduction in my subjective ‘hunger’ and found it much easier to follow the meal time line. Most cravings disappeared although I occasionally do crave ‘some’ starch and cook up some veggies and fish with quinoa or brown/wild rice. As long as I can eat raw fruit, I no longer crave sweet baked goods (and I have a powerful sweet tooth). I have added avocado and much more fish and have added a number of supplements (co-enzyme Q10, acetyl-L-carnitine, Tonalin CLA, alphna lipoic acid and increased my fish oil intake. I’ve lost 25 lbs and hope to lose an additional 20-30 but time will tell. This is the ONLY diet that has really worked for me as the typical reduced calorie/increased activity didn’t work like it did in the past. If I can get my transient migratory pain flares under control as well, I can increase my exercise which may improve my fitness level as well! I do have to bring my own foods to family get-togethers and social events, but I figure that finally finding a way to healthful eating the suits my body is worth the slight inconvenience. I feel the same way about spending more at the grocery store….my health is worth it. I had morning BG readings(85-97) having a snack 2 hours before bedtime. After 1 week on the Rosedale diet (no betime snack) my reading have been between 100-108. This includes daily exercise on both instances. I’ve been told that my protein/fat intake is being converted to glucose since my body has been a sugar burner. Is this correct or is there another explanation. I can tell from the comments above that many people haven’t read either of Byron’s books. 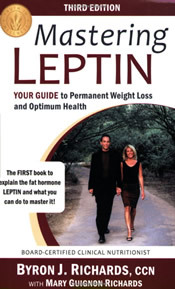 The “Anonymous” person said that the rules have nothing to do with Leptin, but both books explain exactly what they have to do with leptin. Also, there is so much information on why just eating less does not work for everyone. Please people understand the topic before you post something. I have read the books and have a basic understanding of what leptin is – I have tried the Leptin Diet and it worked great for me. Now, I follow the rules without even thinking about them. I don’t have cravings anymore and I continue to keep the 25 lost pounds off. I have been on the Leptin Diet for three weeks and am averaging 3 pounds per week. I have a lot of hormone problems, hypothyroid, hashimotos, female hormones and this diet has worked wonders for me. I felt starved on the South Beach diet and just found it impossible. I have never had a diet work for me like this one. I think the food portions and not eating between meals has worked wonders for me! Might not be for everyone but if you have hormone troubles..this is the diet for you! I also had adrenal disorder two years ago and finally now am feeling great. I was very, very ill for two years and now feel so much better. It also helps the Fibromyalgia a lot. If you have Fibromyalgis…get his Mastering Leptin book too. Both are best as the the Mastering Leptin can get into some heavy stuff and the paperback short version is a good read and simple to understand! I find the South Beach Diet to accomplish the same goal and with fewer cravings. This Leptin Diet is heavy on startches and might be a problem for those prone to diabetes or issues with blood sugar regulation especially in these stressful times, or anyone with low thryoid or fatigue issues. I’d rather Besides, who wants to weight and measure everything? Check out the diet that thousands of Florida citizens requested be written into a book – a diet created by a cardiologist looking to control his own weight. South Beach just makes so much sense and you can eat as often as you like. you are to have 3 meals a day, that are unprocessed and full of fresh nutritous foods. breakfast have a peice of raw whole fruit on an empty stomach and follow with a medium bowl of raw oasts. This cleans away all toxins from the body and the high fiber keeps you full for longer, add cinnamon and this will ensure your blood sugar levels remain equal. Have a small recess of fresh whole fruit and some unsalted unroasted nuts such as almonds – not peanuts or cashews. this will give you protein, continue the fiber and help to keep your metabolism running fast. Have a lunch that is a salad and low fat meat sandwhich with some carrots and celery on the side. The carrots and celery are negative calories and high in water so eat as much as you want. The bread should ideally be wholemeal or rye and full of seeds because it has lower sugar and higher fiber and lower gi than white bread. have little or not butter/mayonaise/sauce because these are added calories that are undeeded. for afternoon tea have a small handful of dried fruit and a carrot/celery. this continues your metabolism running and has lots of vitamins nad minerals and protein. for dinner have lean meat with fresh salad without dressing. add lemon juice to keep the salad fresh and wil aid with digestion. most people should have up to 30grams of fiber but get about max 10grams a day. a diet high in fiber and protein helps you fuller for longer and can prevent many cancers and diseases. drink lots of water, this will detox your body and rehydrate you which can then get rid of water weight – which is water that lies on the outside of your cell rather than the inside. by rehydrating your body you hydrate the inside cells and that gets rid of the fluid on the outside cells. diet, pls mail me the do n dont’s for Vegetarian. Breakfast, Lunch and Dinner. Oh, and the above “diet meal plan” is not very good. I’d recommend simply eating a good breakfast of your choice, followed by a normal lunch 5 or 6 hours later, then completing the cycle with a regular dinner 5 or 6 hours after that. You’re not suppose to “snack” on anything, but when I do violate this rule, I snack on whole cherries, raw carrots, celery, etc. A: It depends. What are you eating? How much are you eating at each meal? When do you eat your meals? How many snacks, diet cokes, pieces of fruit, etc., do you consume between meals? How much stress is in your life? How much sleep do you get each night? The reason I ask this is because I have followed the 5 Rules for quite a while, and my body has settled down into a comfort zone of its own seeking. I lost 30 pounds quickly and easily without having to do much more than adjust my eating and sleeping habits. Dr. Rosedale’s book is very good – along with the WXL product — even my MD is fascinated – most of it is very low glycemic (which is being done in Canada and Aus and very easy to follow. And do remember 1 inch of muscle weighs 3 times more than 1 inch of fat -so instead of using your scale – use your tape measure — you want to keep the muscle and lean and rid yourself of the “fat” — some basic key elements are basically avoiding anything that is processed, white flour, white sugar, artificial beverages, a great sweetner is SweetFiber as it has nearly 1 full gram of fiber in each little packet and is delish!! The only “breads” are the sprouted grain ones – Ezkiel has a low glycemic that is delish and so does French Meadow Bakery — delish bagel with 14 grams of fiber/10 protein and 1/2 is very filling!! I’ve some PDF’s that are very helpful in learning low glycemic (it really is very simple once you understand it and very high fiber which is beneficial to all of us!! And snacks are encouraged – now a snack is 8-10 raw almonds, 5 pieces of cheese (real cheese not processed american crappola) the size of 5 dice — serving of meat protein is about the same size as a deck of cards. And within a few days cravings diminish dramatically!! The five rules have NOTHING to do with leptin. They are using “Leptin” as some magical buzzword. the 5 rules break down into “eat less”. Duh. You can easily find the 5 rules online by searching. But the book Mastering Leptin has more than the 5 rules. It is very scientific so the majority of people won’t care for wading through the mountains of scientific research he summarizes. Also, I’m finding that the 5 Rules don’t work for everyone. My body seems to like waiting 12 hours between eating dinner and eating breakfast the next day, but going 5 hours between meals was not reasonable. I became shaky and didn’t feel well at all, even though my blood sugar readings were completely normal, so it wasn’t due to hypoglycemia. I think a better plan for dealing with leptin resistance is Dr. Rosedale’s diet, even though it’s more stringent. Dr. Rosedale recommends not eating within 3 hours of going to bed, so by the time you add up the 3 hours plus the 7-8 hours of sleep, it equals Byron Richard’s 12 hour recommendation. Byron Richard’s supplements are also way over priced, and many of them simply aren’t necessary. Rosedale recommends supplements, too, but you don’t have to buy “his” brand of them, and you can get by on fewer than he recommends. How come I am putting on weight having just three meals a day?